Did you know? The Andean condor has the largest wing area of any bird. The Andean Condor is a species of South American bird in the New World vulture family Cathartidae and is the only member of the genus Vultur. Found in the Andes mountains and adjacent Pacific coasts of western South America, it is the largest flying land bird in the Western Hemisphere. It is a large black vulture with a ruff of white feathers surrounding the base of the neck and, especially in the male, large white patches on the wings. The head and neck are nearly featherless, and are a dull red color, which may flush and therefore change color in response to the bird's emotional state. In the male, there is a wattle on the neck and a large, dark red comb or caruncle on the crown of the head. Unlike most birds of prey, the male is larger than the female. How large is an Andean Condor? 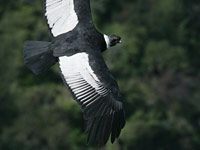 Andean condors are massive birds, among the largest in the world that are able to fly. Their wingspan can reach 3.2m and they can weigh as much as 15kg. Young condors do not learn to fly until they are six months old. Because they are so heavy (up to 33 pounds/15 kilograms), even their enormous 10-foot (3-meter) wingspan needs some help to keep them aloft. For that reason, these birds prefer to live in windy areas where they can glide on air currents with little effort. 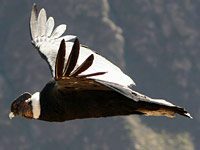 Andean condors are found in mountainous regions, as their name suggests, but also live near coasts replete with ocean breezes and even deserts that feature strong thermal air currents. What does an Andean Condor look like? These condors are mostly black, but males have a distinctive white "collar" around their necks and some white markings on their wings as well. The head and neck are nearly featherless, and are a dull red color, which will become brighter red and therefore change color in response to the bird's emotional state. Like their relatives, the California condors, Andean condors have bald heads. Unlike most birds of prey, the male is larger than the female. Where does the Andean Condor live? The Andean Condor is found in South America in the Andes. In the north, its range begins in Venezuela and Colombia, where it is extremely rare, then continues south along the Andes in Ecuador, Peru, and Chile, through Bolivia and western Argentina to the Tierra del Fuego. 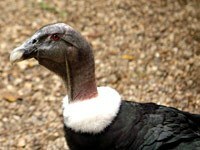 In the early nineteenth century, the Andean Condor bred from western Venezuela to Tierra del Fuego, along the entire chain of the Andes, but its range has been greatly reduced due to human activity. 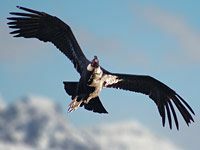 What is the habitat of the Andean Condor? The habitat is mainly composed of open grasslands and alpine areas. It prefers relatively open, non-forested areas which allow it to spot carrion from the air, such as the páramo or rocky, mountainous areas in general. 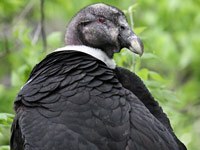 What do the Andean Condors eat? Condors are vultures, so they keep their sharp eyes peeled for the carrion that makes up most of their diet. They prefer to feast on large animals, wild or domestic, and in picking the carcasses, they perform an important function as a natural clean-up crew. Along the coasts, condors will feed on dead marine animals like seals or fish. These birds do not have sharp predator's claws, but they will raid birds' nests for eggs or even young hatchlings. 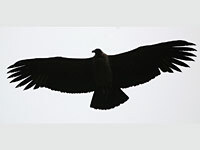 Download free Andean Condor wallpapers, click on the image to open the large version. Print free Andean Condor coloring pages, click on the image to open the large version.